Has it been just another busy and stressful day? Or you just woke up with a stiff neck and headache? Looking for an effective way to relieve pain and stress? Would you like to feel rejuvenated? 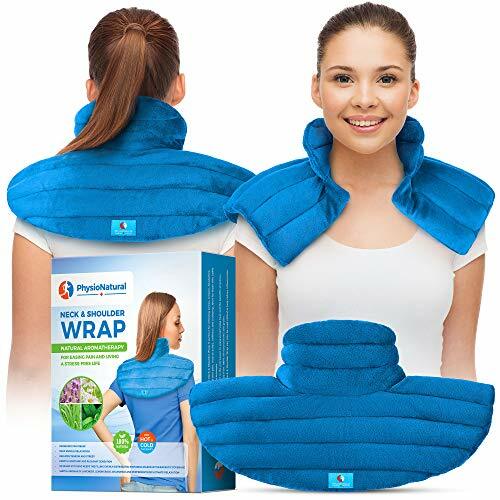 The PhysioNatural Neck & Shoulder Wrap is the perfect way to wrap yourself in comfort after a long day, or give yourself a quick pick-me-up before heading back to work. The extra-long collar and back deliver soothing warmth to all areas at once, so you can feel better instantly. Detailed channel stitching keeps this wrap’s heat-retaining clay beads evenly distributed, so your therapy sessions never miss a spot. A calming mix of lavender, lemongrass, chamomile and peppermint mixed into the wrap’s filling release their fragrance with each reheating, helping you rest and let go of stress and worries. Designed with care by chiropractors and athletes, the PhysioNatural Neck & Shoulder Wrap will help you to reclaim your life from pain and stress. Enjoy the comfort and freedom of natural good health. • Plush minky fabric Neck & Shoulder Wrap 19″ x 12″ , 3.9 Lbs. With PhysioNatural, you take on absolutely no risk with our money back guarantee! Click add to cart now and start taking care of yourself!